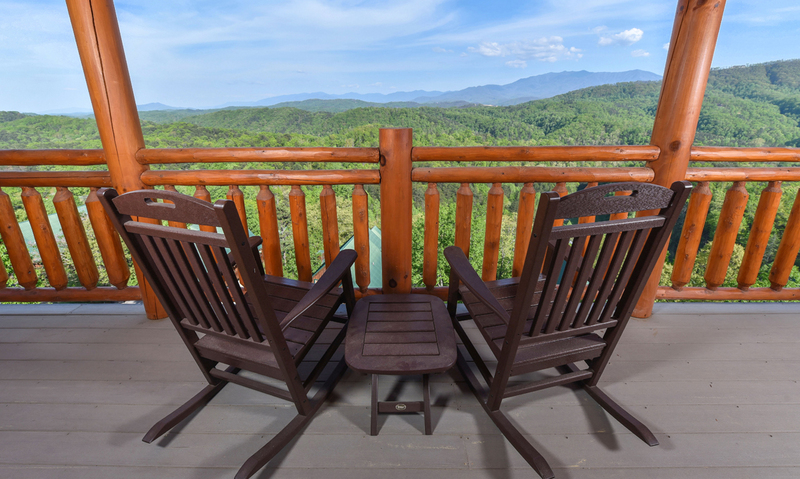 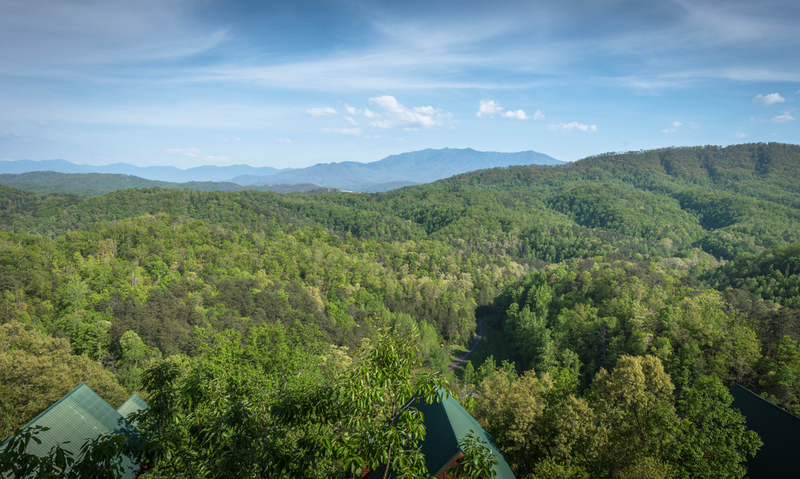 After traveling to the Great Smoky Mountains, a cozy place to unwind and take in the picturesque views is just what you’ll need! 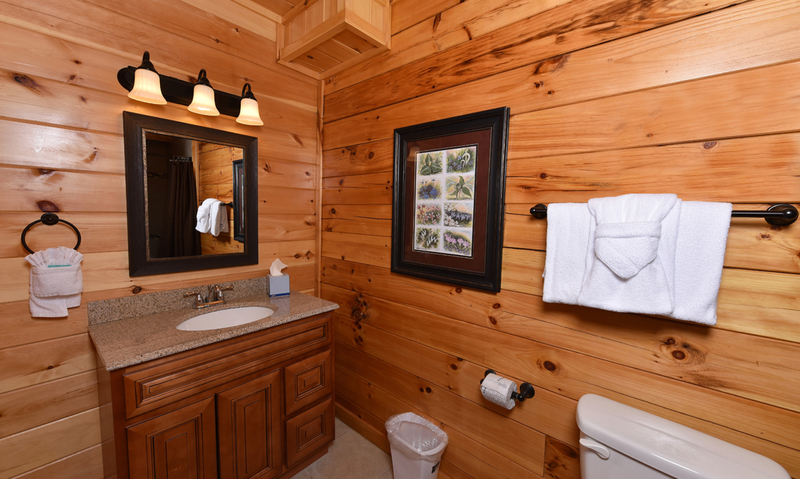 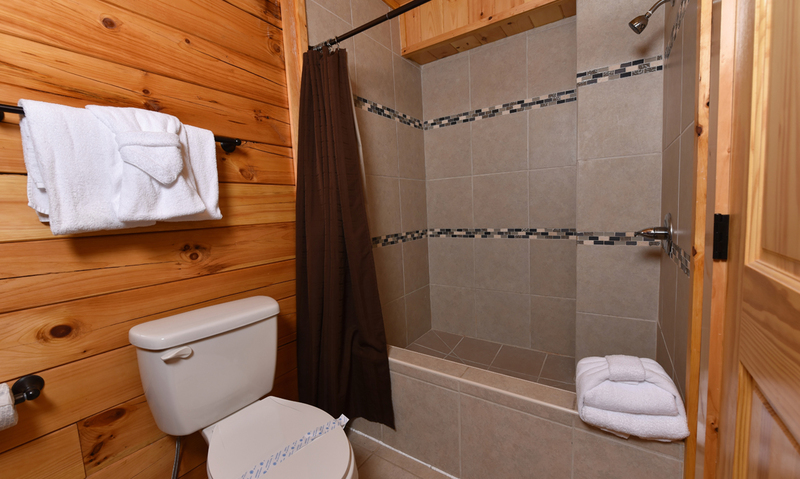 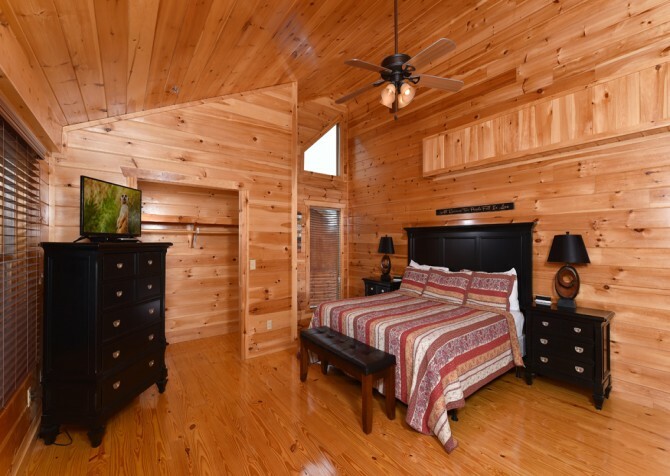 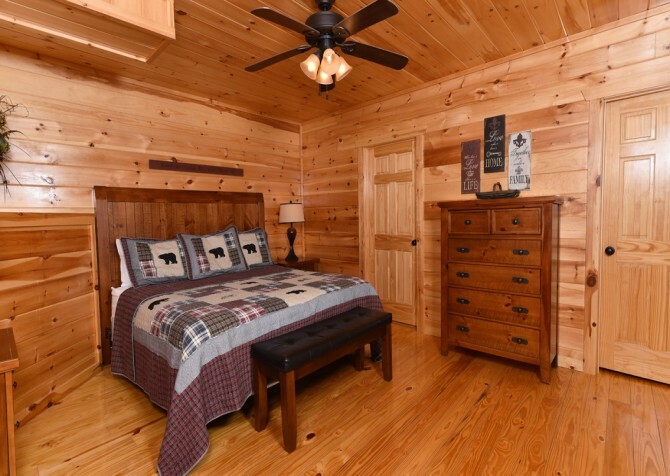 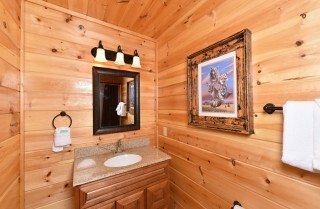 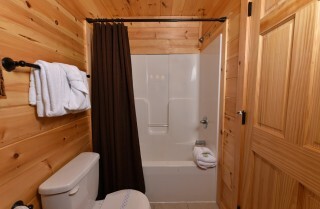 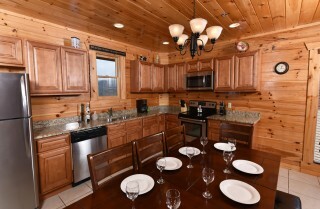 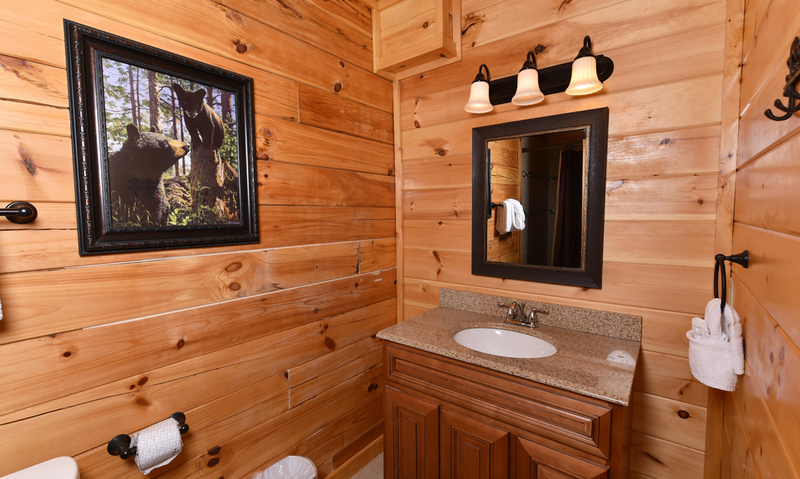 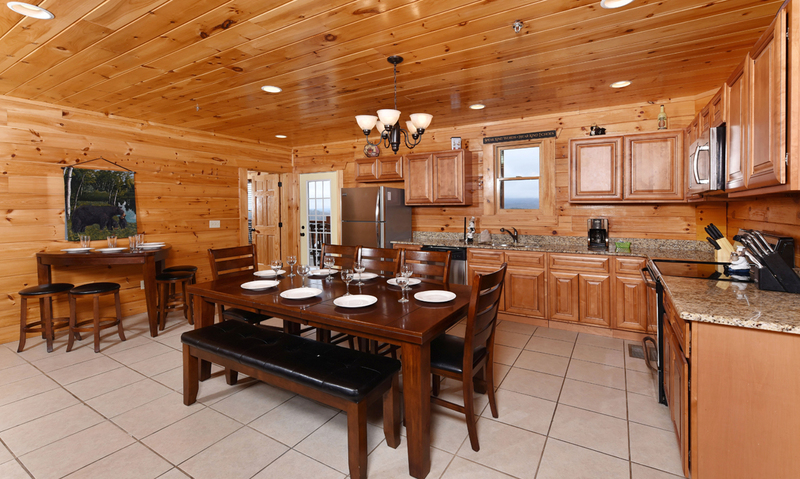 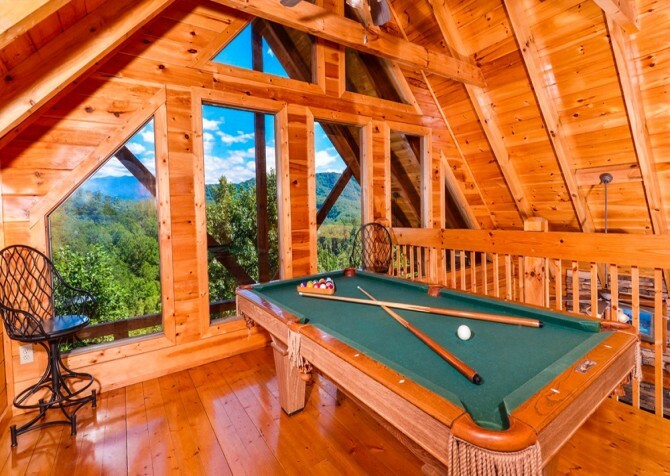 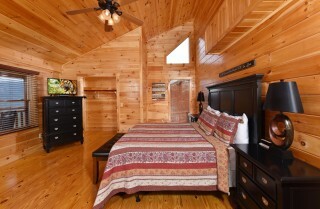 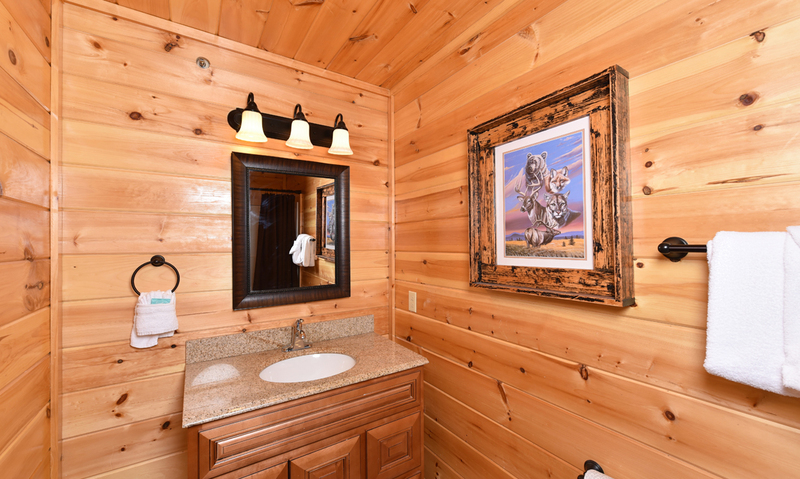 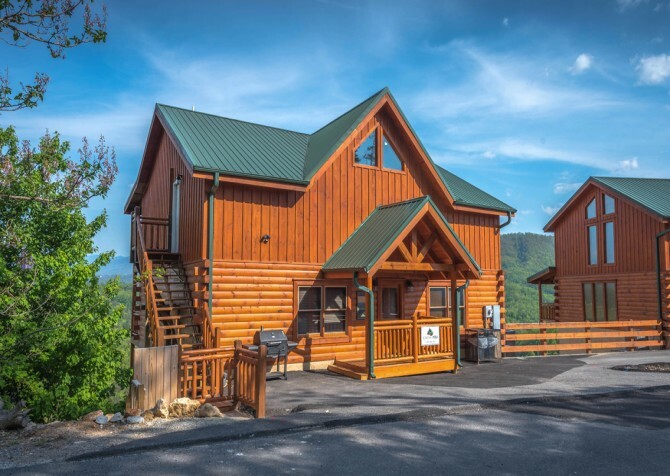 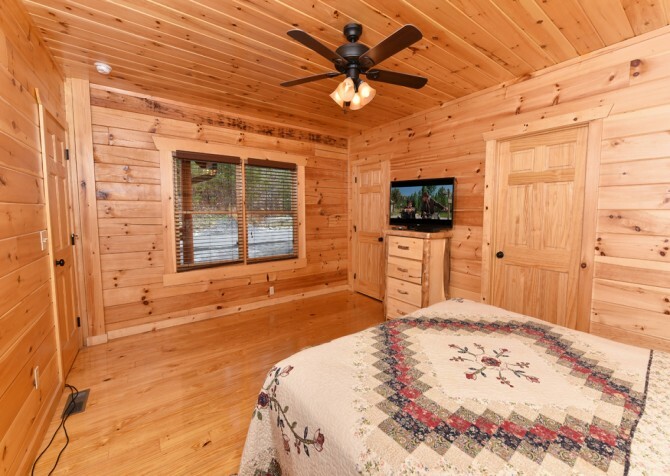 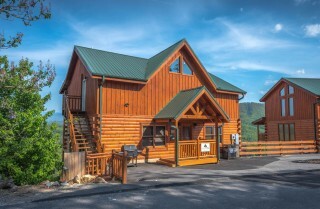 Join family and friends at Fitzgerald’s Shamrock Chalet, a 3-floor, 4-bedroom, 4.5-bathroom cabin for 15 in Pigeon Forge, featuring entertaining amenities and all the comforts of home. 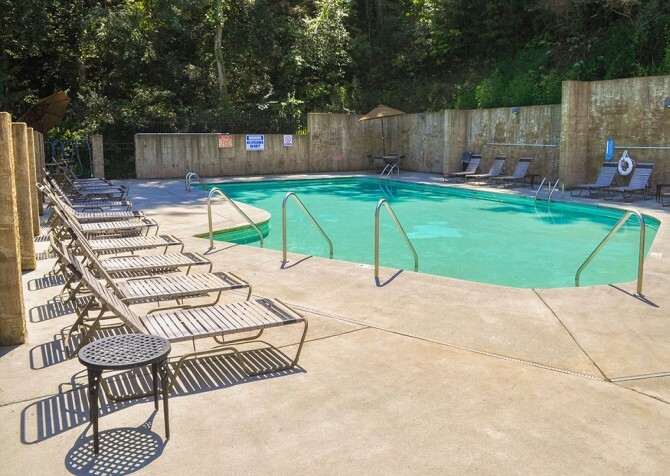 Begin your day with a hot breakfast from the fully equipped kitchen, lay out arts and crafts for the kids at the dining table, teach your toddler to wade in the private indoor pool, and host a barbecue shindig in the afternoon — with the big game on the big screen TV! 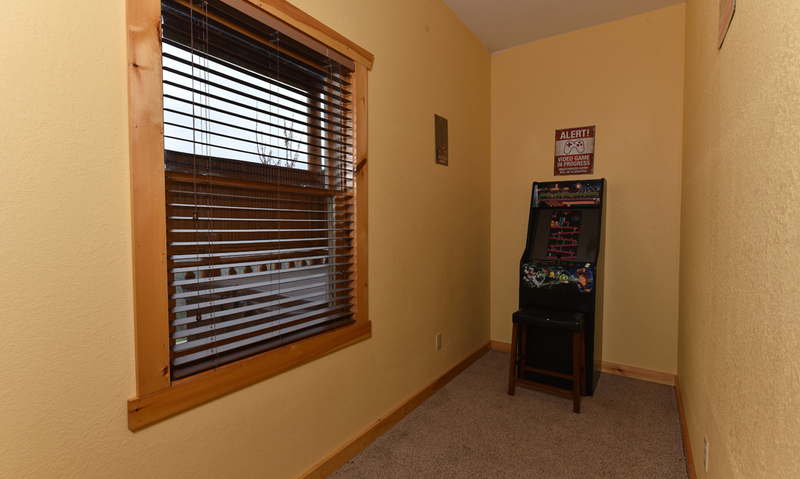 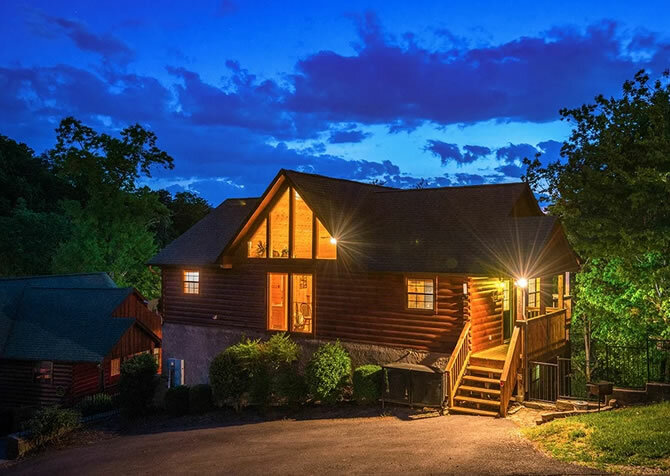 As evening approaches, prepare tasty snacks for movie night in the home theater, enjoy sunset mountain hues from the rocking chairs on deck, participate in an arcade battle, scroll via the Wi-Fi, and end the night with a cuddle in the king-size bed. 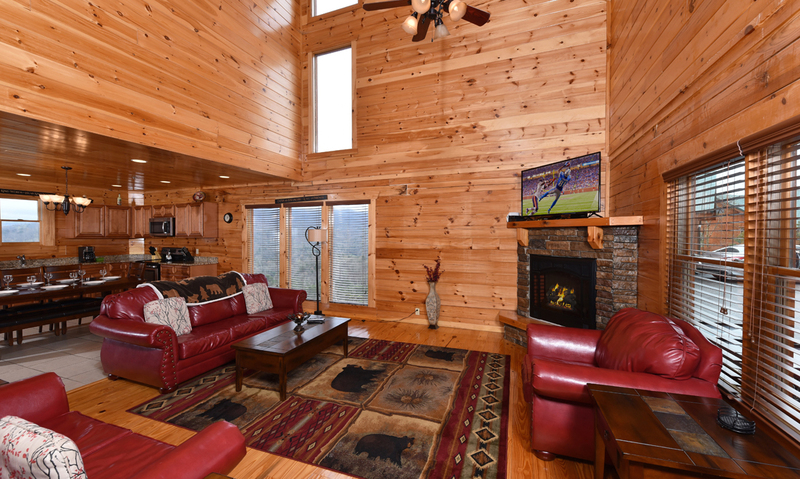 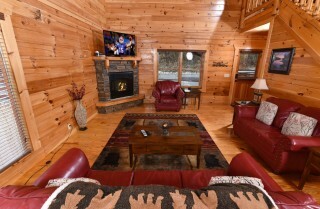 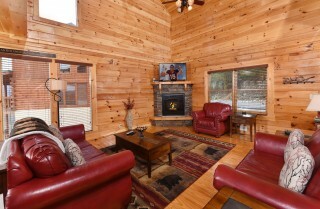 All this and more is waiting for YOU at Fitzgerald’s Shamrock Chalet, a relaxing escape in the Smokies! 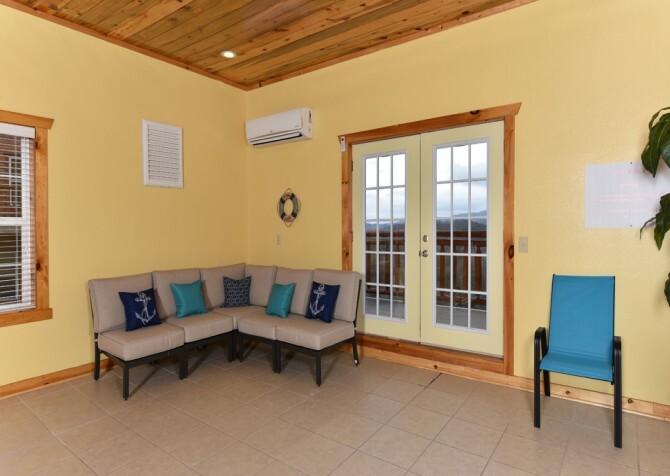 As you step into the living space of this charming home, leave your stress behind and start your vacation off right with a comedy on the big screen TV, a conversation with friends on the sofa, or a restful nap on the loveseat. Looking for a bit of privacy? 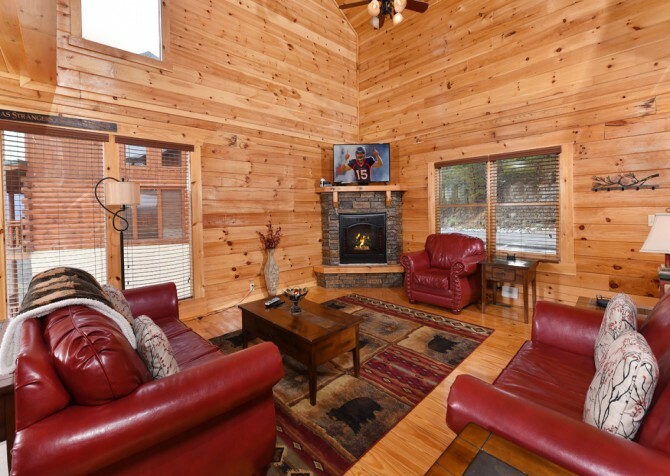 Take the evening for yourself and enjoy a good read in the armchair — with a toasty fire in the electric fireplace to really set the mountain mood. 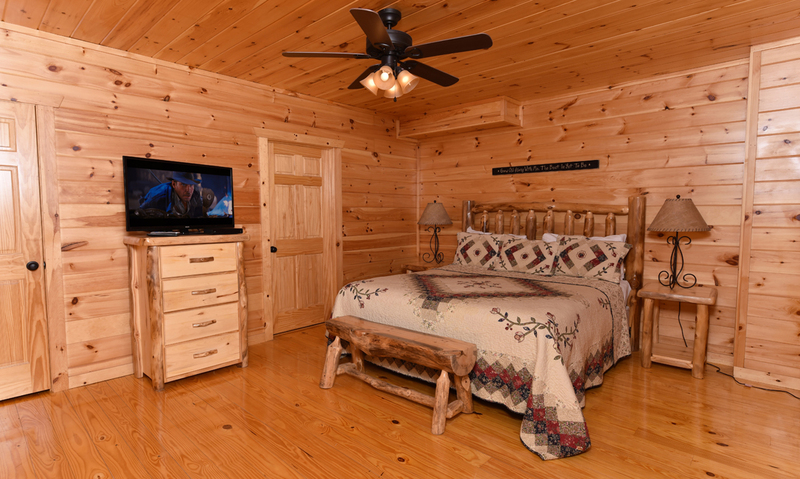 As nighttime draws near, pull out the sleeper sofa for a snooze or pile snacks and drinks on the coffee table to end the day with a classic film before hitting the hay. The choice is yours! 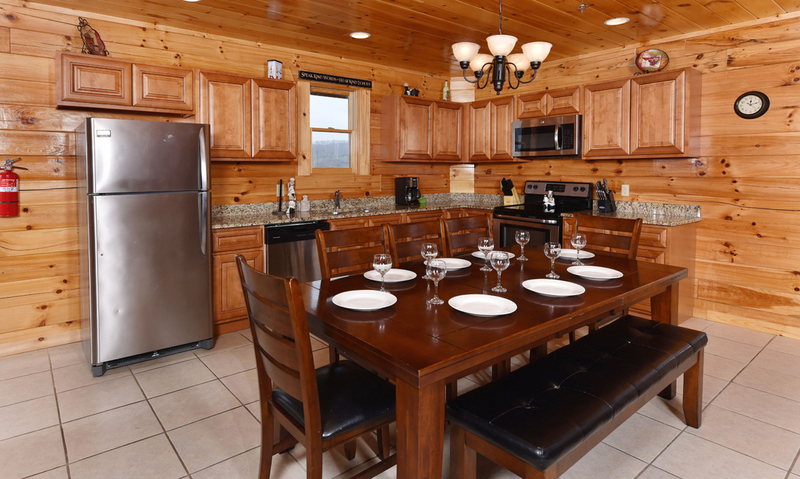 With an open concept throughout the home, the kitchen is an inviting space, keeping everyone connected no matter the time of day. 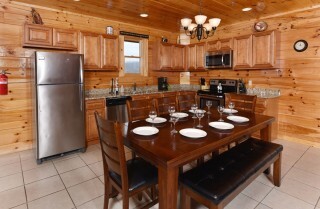 Prepare breakfast with the little ones in sight, set out a lunch spread for the whole gang to enjoy with a show in the living room, and easily lend a helping hand for dinner. Fully equipped with stainless-steel appliances, this kitchen is ready to whip up any meal! 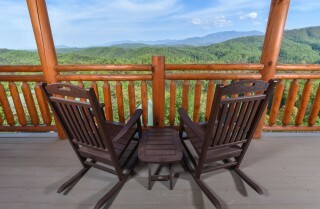 In the morning, brew a full pot of rich coffee to share (or not) and rinse fresh fruit in the double sink — with a gorgeous mountain view through the over-the-sink window, competitions will break out for this “chore.” Before the sun sets, grab local veggies from the fridge, stir fry up a storm on the stove, and clean as you go with the handy dishwasher. And don’t forget to pop a movie night favorite in the microwave before the feature film begins! Mere steps away from the preparation station (aka the kitchen) awaits the dining area, which harbors a large dining table for 8 and a breakfast nook for 4. Feel free to sit the youngsters in the living room with a show as the living space will keep them comfortably within earshot. 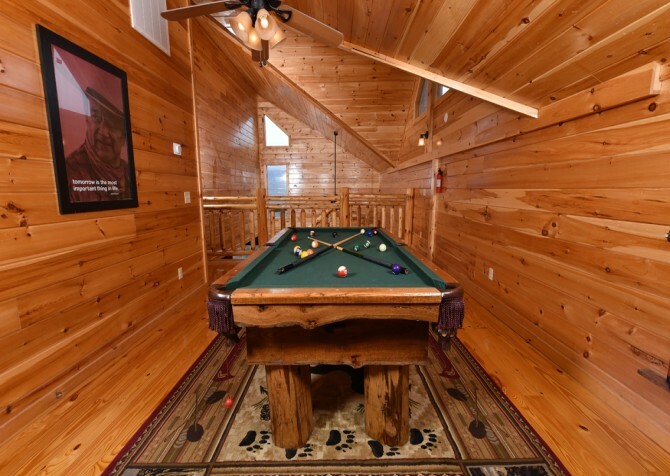 After finishing your meal, clear the tables for a bit gaming fun with board and card games brought from home — who says you can’t play on the mountaintops? If pool is more your game, head to the upstairs loft for a few friendly rounds or a competition with the whole group. Keep the mounted flatscreen TV on an exciting show to really get the blood pumping and entertain those awaiting their turn with a cue. Find yourself to be extra competitive? 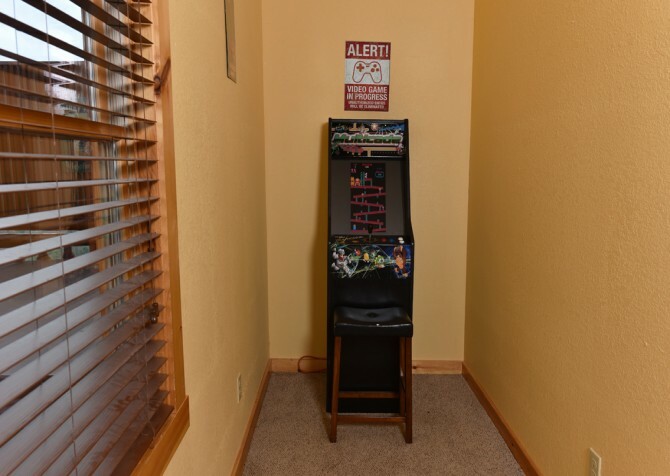 Compete with the highest scores on the arcade unit downstairs instead, featuring multiple games to defeat over your stay! 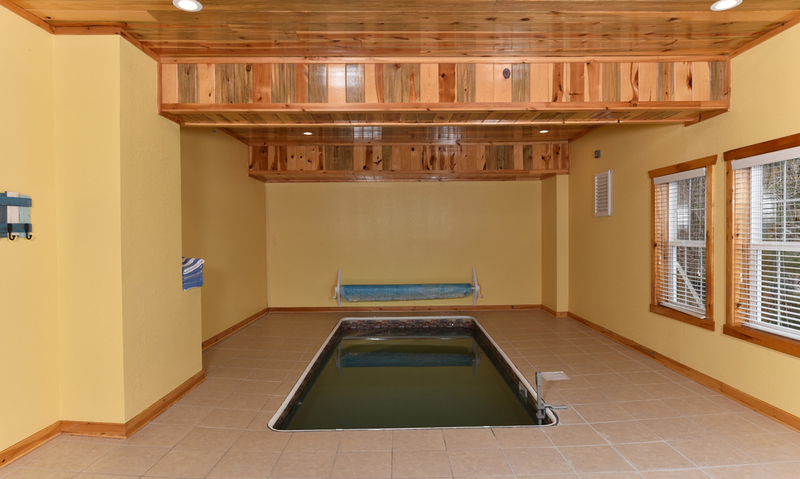 After all the gaming excitement, it may be difficult to wind down, so throw on your swimsuit and splash around in the private indoor pool to burn off the excess energy. At 8 feet wide and 18 feet long, this indoor pool - kept at 85 degrees - is just the right size for a relaxing float or a swimming lesson with the kids. 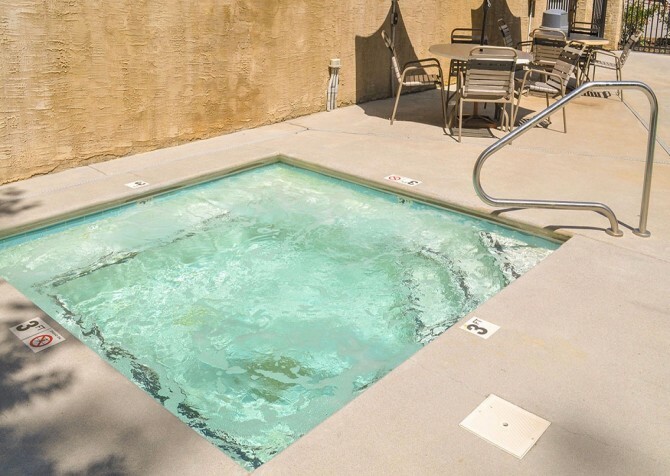 Plus, there’s a cushioned seating area, perfect for chats with your bestie while the little ones paddle to their heart’s content in the shallow end (3.5 feet) or the teens wade around in the deep end (5.5 feet). And the best part is you’ll have this pool all to yourself within the privacy of your very own cabin in the Smokies! 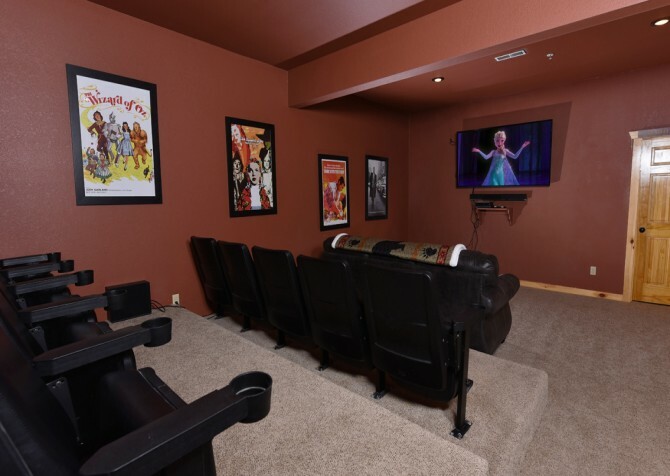 When everyone is all tuckered out, gather the troop for movie night in the private home theater — complete with 10 genuine theater seats, a comfy couch down front, Blu-ray and DVD players, surround sound, and a 70-inch flatscreen HDTV! Be sure to grab plenty of snacks from the kitchen and pop drinks in the convenient drink holders, too. 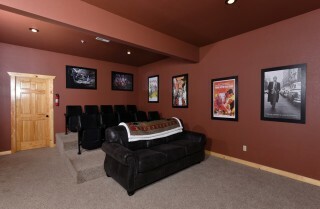 Concerned the kids may head to dreamland during the feature film? Pull out the sleeper sofa and tuck them in before the movie begins — convenient and adorable. 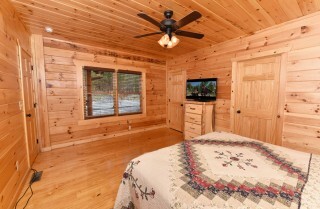 With a flatscreen TV and space aplenty in all 4 bedrooms, this home was made to keep guests in comfort. 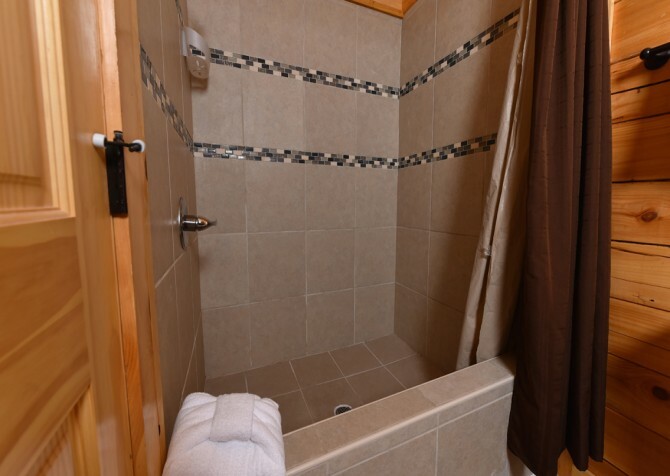 When you’re wiped out from the day’s fun, soothe your muscles in a walk-in shower (2 on the lower level) and head to one of 2 entry-level bedrooms for a snuggly snooze on a king-size bed. 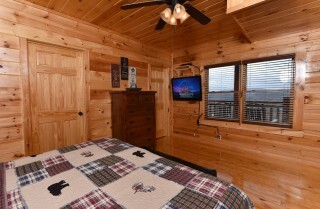 Prefer a room with a breathtaking mountain view? 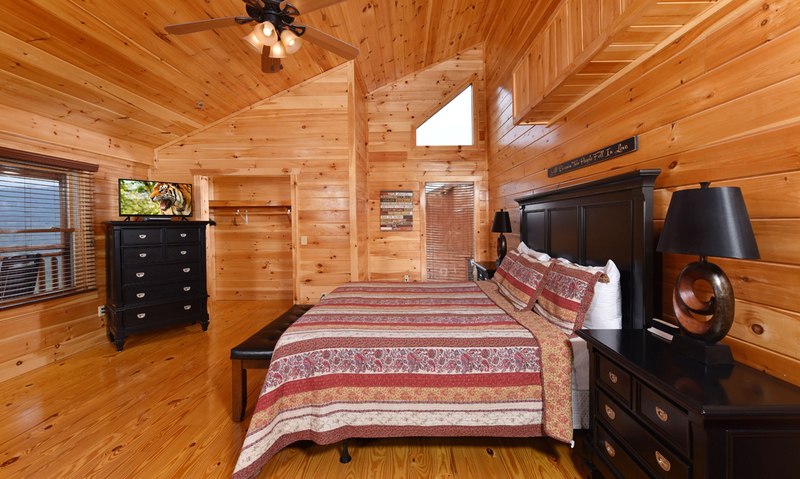 Venture upstairs to the master suite — boasting a king-size bed and direct access to the second-floor deck. 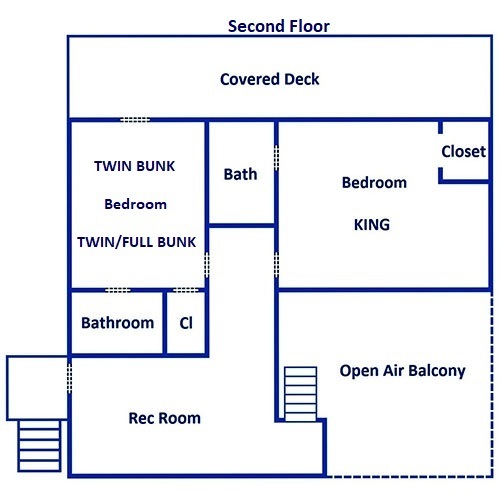 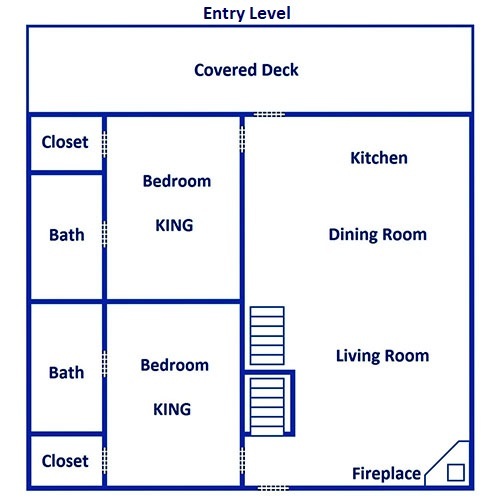 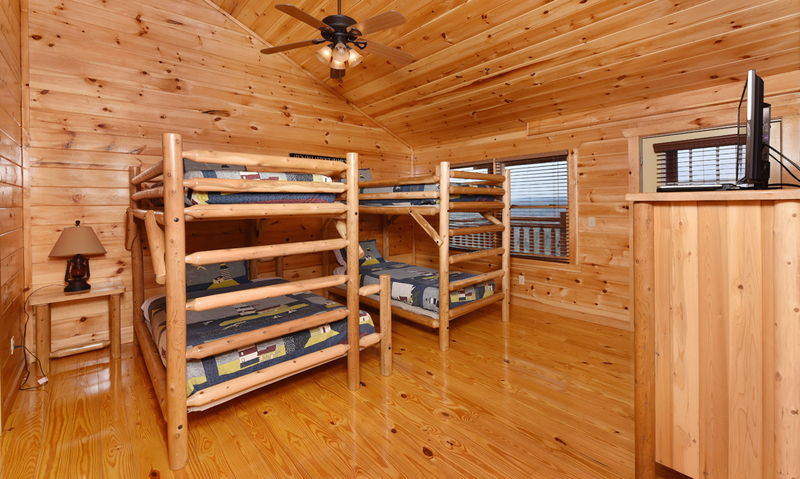 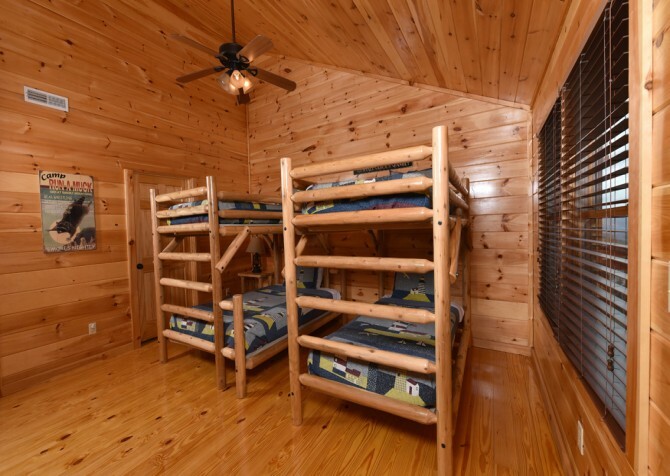 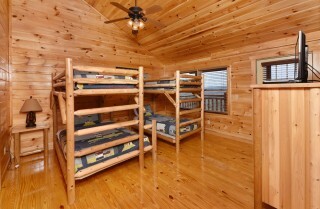 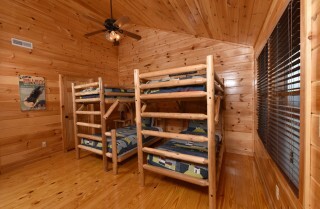 Even the nearby bunk room, which harbors 1 twin-over-twin bunk and 1 twin-over-full bunk, features direct deck access! 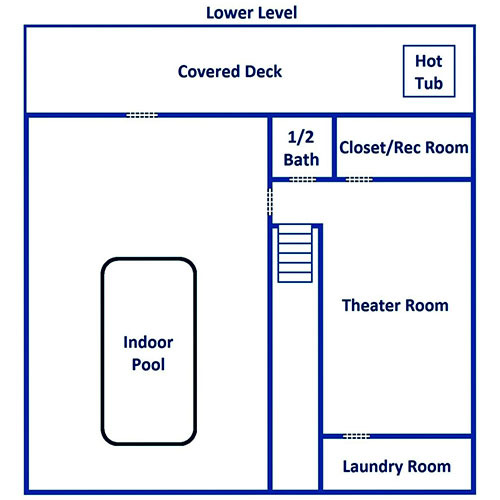 Best of all, the second floor holds 2 standard shower-tub combos, where the kids can get out their wiggles in a bubble bath before bed. When you arrive to this Smoky Mountain home, the first thing you’ll notice is the flat driveway to make the trip easier for all (including motorcycles), parking spaces for 4 to allow room for friends, and a gas grill great to host a barbecue party. 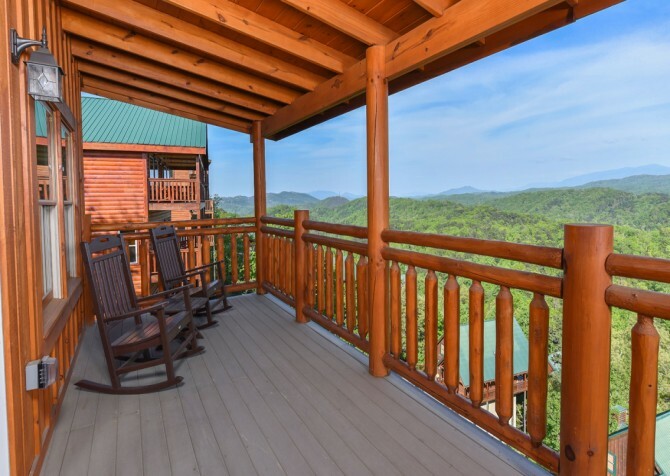 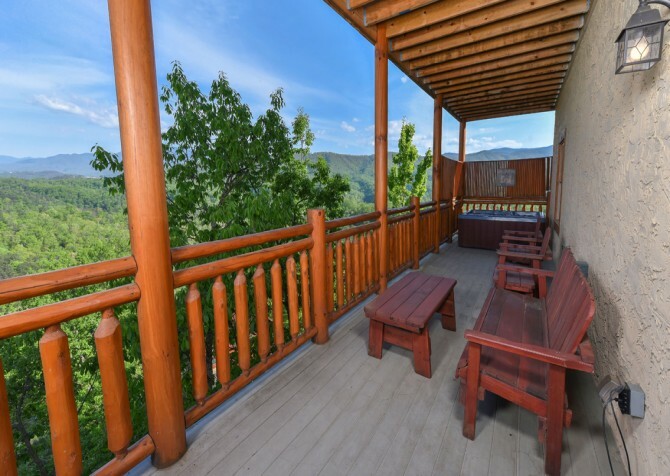 Once you leave the car, head into the cabin, walk straight to the entry-level deck, plop on a rocking chair, and soak in the impressive mountain views. 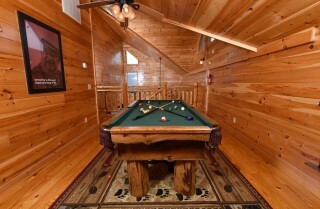 What a way to start your vacation! 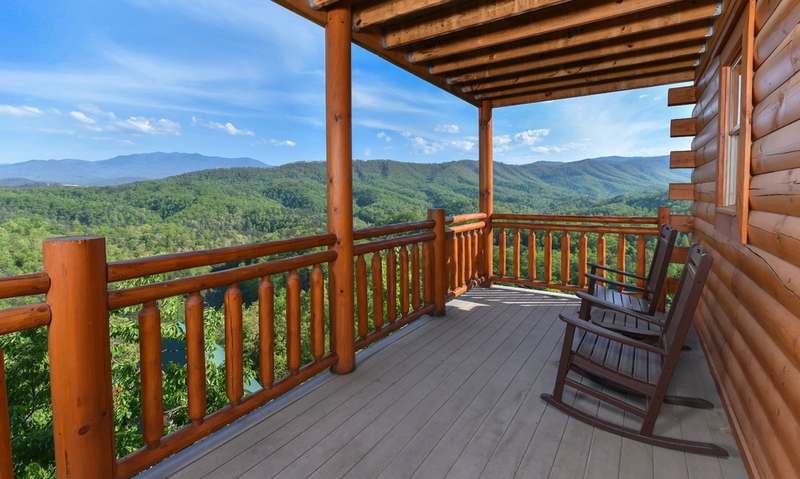 When ready, make your way to the second-floor deck to view the Smokies in a new light — now’s a great time for selfies. Before you play a film in the private theater, grab your swimsuit and enjoy a relaxing soak in the outdoor hot tub. 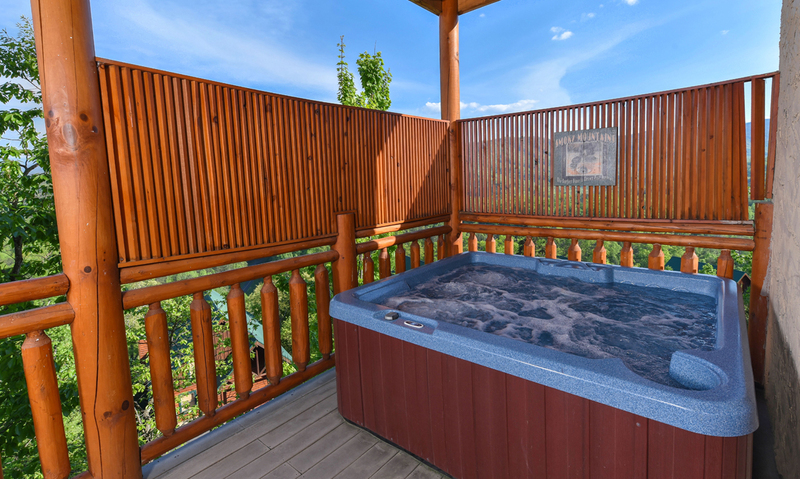 It’s a great way to unwind after a long day of travel or simply spend some romantic time as a couple. 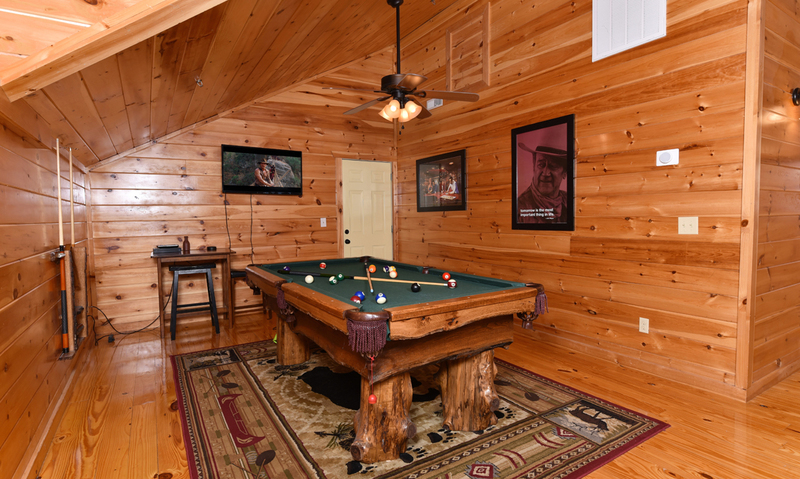 Offering community pool access through Sherwood Forest Resort, this cabin home not only gives you the privacy and convenience of an indoor pool year-round but also the incredible opportunity to sunbathe and splash outdoors in summer! 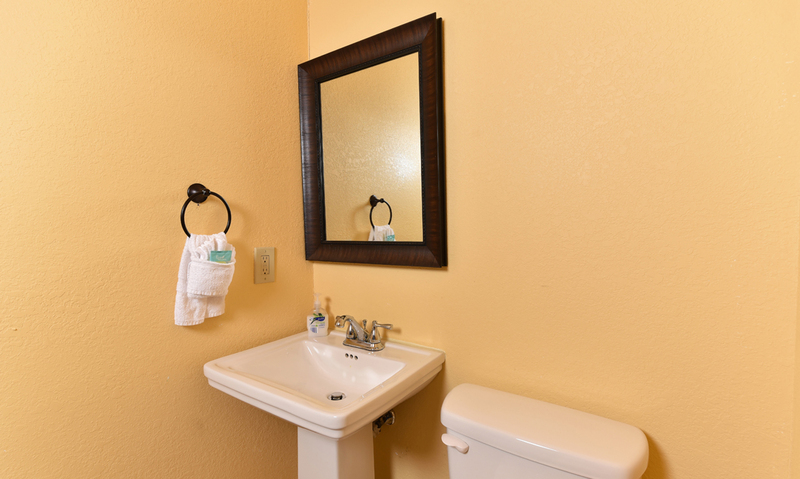 After a fun outing at the pool or in town, throw your towels and clothes in the provided stackable washer and dryer downstairs to keep your suitcases fresh on the return home. 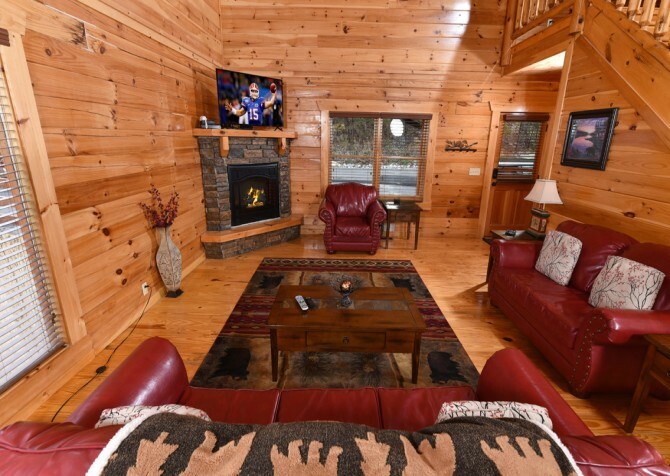 While resting on the sofa, feel free to surf the web via the Wi-Fi, or relive precious moments of the past with home videos in the vintage VCR. 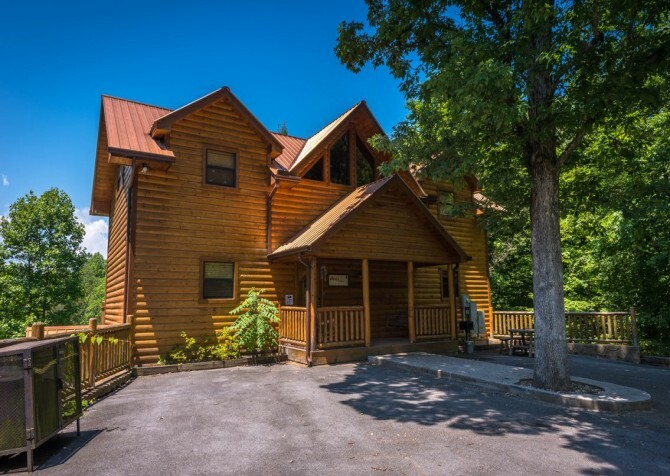 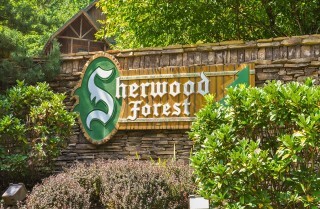 Located about 5 miles from downtown Pigeon Forge, Fitzgerald’s Shamrock Chalet makes it easy to drive into town for gourmet meals, endless shopping, and family fun! So gather the crew and head to town for even more unforgettable Smoky Mountain memories. 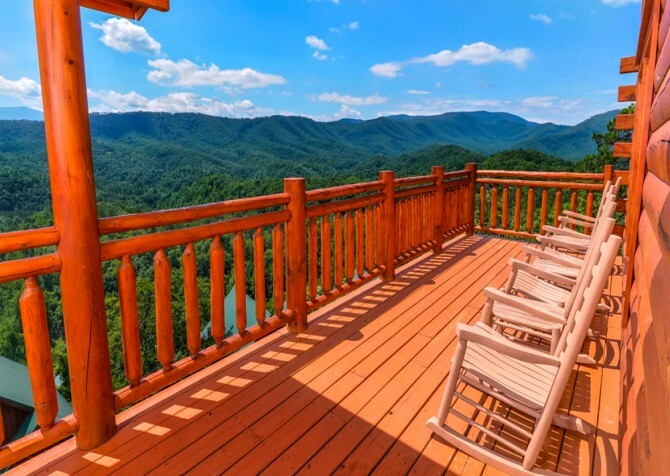 Enjoy mesmerizing views of the mountains, the city, and Douglas Lake as you soar high in the sky across 11 ziplines at Zip Pigeon Forge. Only 4.5 miles away, Dollywood — a thrilling amusement park in the mountains — is a fun attraction for all ages, featuring fantastic food, exciting rides, and country music around every corner! 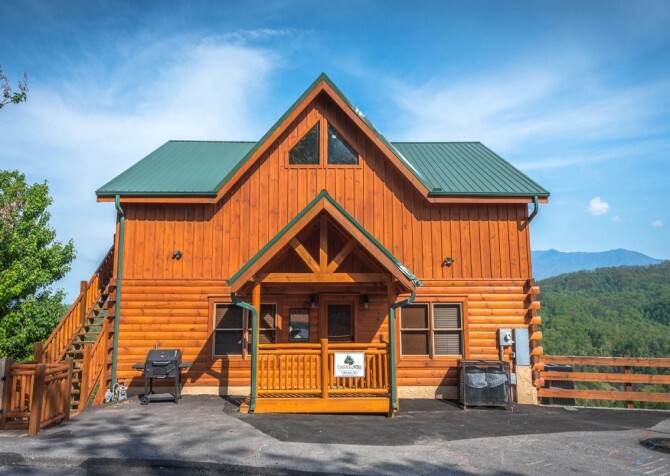 Bring along a group of friends to tackle thrilling go-kart courses, shameless bumper cars, classic arcade games, and more at The Track Smoky Mountains!